Samuel Stanhope Smith, Princeton’s seventh president (1795-1812), was an early defender of the unity of mankind—arguing that environment, not innate biological differences, determined one’s race. His convictions, however, did not prevent him from owning slaves himself, and his teachings ultimately influenced Princeton alumni to establish the American Colonization Society. Samuel Stanhope Smith, president of Princeton from 1795 to 1812, might have seen some irony here. Smith himself had presided over an institution seething with student discontent: during his presidency, undergraduates rioted on several occasions and managed to burn down Nassau Hall in 1802. And Smith, too, grappled with questions of race. In his time, he was celebrated on both sides of the Atlantic as the leading defender of the “unity of mankind.” Differences in physical appearance and skin color, he argued both in print and in his Princeton lectures, were entirely the product of one’s environment. Race was a chimera. Smith’s theories—forward-thinking for the time—failed to align with the practices of race both nationally and at the college. Slavery was embedded at Princeton long before Smith assumed the presidency in 1795; in fact, it was there from the beginning. All six of Smith’s predecessors as president were slaveholders, along with many of the founding trustees. Yet while Smith’s explanations for human difference made him a theoretical opponent of slavery, he rarely engaged the practical problem of emancipation. Like his predecessors, he was limited by subtle biases that conditioned his embrace of human difference. At root, Smith never abandoned the belief that white people stood at the apex of human society. He passionately insisted that African Americans and Native Americans could become white if placed in different environments, or after intermarriage with whites. But when this physical transformation failed to take place, he struggled to imagine other pathways to racial equality. 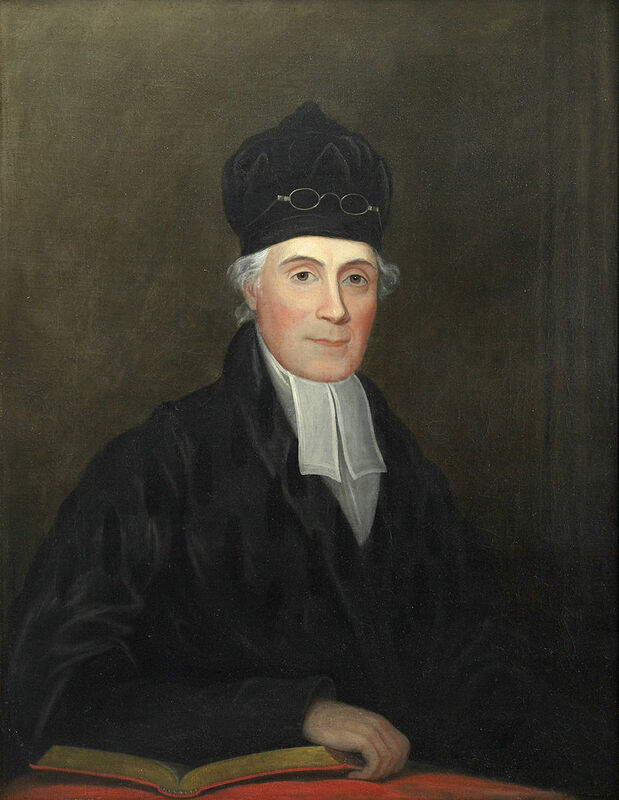 Portrait of Samuel Stanhope Smith, Princeton's seventh president (1795-1812). Samuel Stanhope Smith was born in Pennsylvania in 1751, and graduated with the Princeton class of 1769 with a passion for mathematics, natural sciences and theology. Like his father, Smith became a Presbyterian clergyman and teacher. Unlike many of his contemporaries, Smith saw no conflict between religion and science, and attempted to reconcile the two during his long career—transforming Princeton’s curriculum in the process. When Smith began teaching at Princeton in the 1770s, the college was principally a training ground for Presbyterian ministers. By 1812, when he resigned the presidency, undergraduates were studying chemistry and philosophy (and creatively combining the two in their explosive protests against the administration). Princeton’s emergence as the most modern college in the nation alarmed many of the trustees, who happily accepted Smith’s resignation. The Presbyterian church, meanwhile, felt the need to found a theological seminary within sight of Nassau Hall to do the work that the College of New Jersey had once performed. Smith’s stridency as a college president was matched by his bold thinking about race. Smith came of age at a moment of huge interest in the subject. Imperialism and the Atlantic slave trade had brought Europeans into contact with peoples across the globe, raising a key question: since human beings in different parts of the world looked very different, how could they all be descended from Adam and Eve? To answer the question, Enlightenment scientists and philosophers theorized that human beings were profoundly shaped by the environment (natural and social) in which they lived. The French naturalist Buffon ventured a memorable hypothesis: if you took a few dozen residents of Denmark and swapped them with a few dozen Senegalese, within a matter of generations the descendants of the groups would swap places—the black would be white, and vice versa. Armed with their confidence in the power of the environment to shape humankind, theorists like Smith felt they had solved the mystery of human diversity without threatening humanity’s roots in the Garden of Eden. 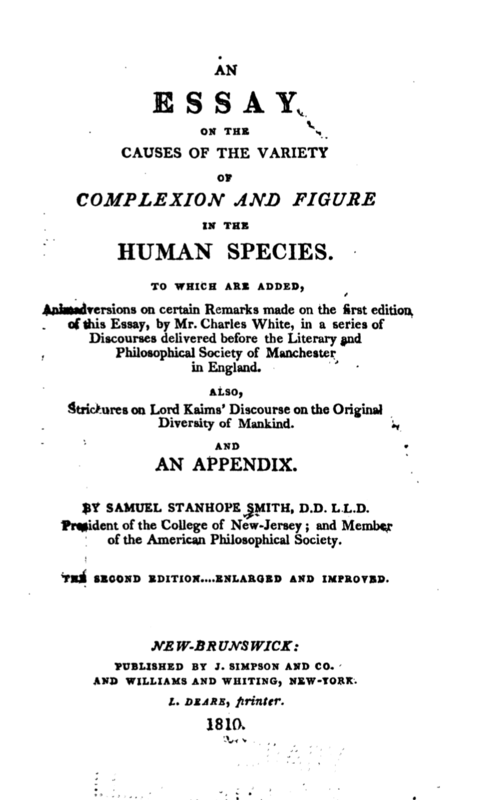 Samuel Stanhope Smith's "Essay on the Cause of the Variety of Complexion and Figure in the Human Species," first presented in 1787. Smith was a universalist, believing that all human beings had the same potential, but decidedly not a relativist. He didn’t recognize African or Native cultures as equivalent to Anglo-American culture, and his hopes for the nation’s future were grounded in his belief that African Americans and Indians could be 'improved'—both physically and culturally—until they closely resembled white people. Samuel Stanhope Smith must have known the sad ending to White Eyes’s Princeton career, but he changed barely a word of his enthusiastic account in the Essay’s 1810 edition. During the intervening decades, Smith’s ideas about racial ‘improvement’ had been reworked on a national scale. The administrations of Washington, Adams and Jefferson had crafted a ‘civilizing’ policy that encouraged Native Americans to embrace white society and even amalgamate with white settlers. When Indian nations placed a higher value on their own land and culture, however, they were drawn into wars with the United States—which relieved them of both. Smith had suggested that Native Americans would welcome the chance to embrace a superior civilization. But with no explanation for why indigenous people might prefer their own culture, Smith’s theory ran aground on the realities of westward expansion. Smith’s ideas about the malleability of human appearance and behavior informed his approach to African Americans as well as Indians. Throughout his life, Smith lived among enslaved people. After his years as an undergraduate and then a tutor at Princeton, Smith moved to Virginia in 1773 as a Presbyterian missionary. Within a year of his arrival, his talents were noted by David Rice, a local preacher and an architect of the new Hampden-Sydney College. When Smith accepted the invitation to became the college’s first president in 1775, he was only twenty four years old. The American Revolution had just erupted in the colony, and Virginia’s last royal governor, Lord Dunmore, had issued a proclamation encouraging the slaves of patriots to flee from their masters and fight for the British. Smith, who embraced the patriot cause in Virginia, effectively took the side of the slaveholders who howled at Dunmore’s proclamation. Historian Bruce Dain has argued that Smith’s time in Virginia gave him an opportunity to see “life in a slave society at first hand.” While this is true, it would be a mistake to see Smith’s experience at Hampden-Sydney as an easy or unthinking accommodation with slavery. The Upper South harboured a complex and emerging antislavery sentiment, especially away from the tidewater regions where slavery was most profitable and ubiquitous. Smith’s relationship with David Rice offers a clue that the young Princetonian may already have developed an aversion—in theory, if not in practice—to the institution of slavery. Rice was among the most celebrated antislavery activists in the Upper South during the late 18th century. In 1792, he would famously attempt to persuade the Kentucky constitutional convention to outlaw slavery. Rice, who had many connections with Princeton’s Presbyterian diaspora, clearly recognized something in the recent graduate. Had he realized that Smith was a kindred spirit? Colleges were important sites of antislavery thinking in the early United States. Even in the tidewater region of Virginia, the College of William and Mary witnessed a lively debate among students and faculty over the legitimacy of slavery. Many of Hampden-Sydney’s Presbyterian founders were personally opposed to the institution, and one of Smith’s successors as president freed his slaves during his time in office. From his campus vantage at least, Smith may not have noticed much difference between the culture of slaveholding he had witnessed in New Jersey and the educational frontier of central Virginia. Hampden-Sydney as an institution didn’t own slaves, but hired them regularly to assist in the daily upkeep of the college. Many of the faculty and trustees held antislavery views, but also allowed students to bring their ‘servants’ to campus. These tangled compromises and contradictions knitted together New Jersey and Virginia in ways that challenge our conventional assumptions about sectional divergence. In the 1770s, the North hadn’t abolished slavery and the South hadn’t yet become lost to it. The pioneering reformers of the upper South—even radicals like David Rice—frequently owned slaves, despite their commitment to a future without slavery. After Smith’s return to Princeton in 1779, he slipped easily into the role of the antislavery slaveholder. We know from a 1784 newspaper advertisement that Smith owned at least one slave during his time at Princeton, a farm hand whom Smith was keen to exchange for another slave “accustomed to cooking and waiting in a genteel family.” This preference for house slaves made its way into Smith’s Essay. There was, he insisted, a “great difference” between the facial features of “domestic and field slaves.” House slaves soon began to resemble their masters, both in their features and their conduct. This gave Smith hope that, if “admitted to a liberal participation of the society, rank and privileges of their masters, they would change their African peculiarities much faster.” Smith’s bright view of human potential was tethered to the cumbersome belief that African Americans and Indians could escape from their physical appearance as well as from slavery or supposed savagery. 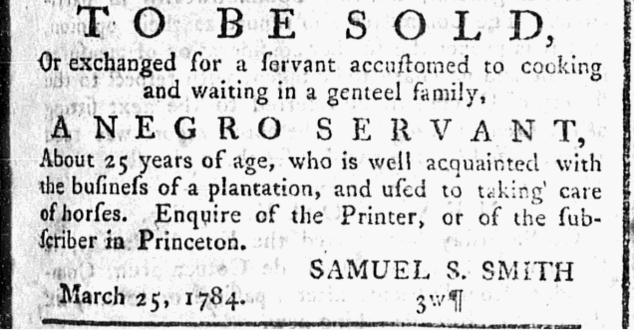 An ad to sell a slave placed by Samuel Stanhope Smith in 1784. Smith took up the subject of racial 'improvement' in his undergraduate lectures at Princeton. He admitted that slavery was wrong, and that white Americans had a duty to abolish it, but insisted that slavery had done real damage to the morals of its victims—damage that had to be repaired before emancipation. “No event can be more dangerous to a community than the sudden introduction into it of vast multitudes of persons…possessing only the habits and vices of slavery,” he declared. His solution was to cultivate “good moral and industrious habits” among slaves before emancipating them. Perhaps slaveholders could give their slaves a small area of land to cultivate in their free time, paying them modest wages and finally rewarding their hard work. The payoff for masters would be a more virtuous class of freed people, a prerequisite for social harmony after emancipation. Virginia abolitionist George Bourne later remarked that Princeton’s southern students must have been laughing behind their hands at Smith’s portrait of the kindly slaveholder. But most white reformers in Smith’s day reasoned from the same assumption that masters would be central to the abolition of slavery. Even if white southerners agreed to ‘improve’ and free their slaves, however, the road ahead was daunting. Smith thought that many whites would retain “prejudices” against ex-slaves that would prevent social cohesion. Newly freed people might become alienated from their white neighbors and fall in with those African Americans who were still in chains. A plan to end slavery gradually might easily spin off into a race war, undoing all of Smith’s hopes. The first half of Smith’s outlandish scheme had a strange afterlife, thanks to the careers of two of his students. Robert Finley, who became a clergyman in Basking Ridge after graduating from Princeton in 1787, was fascinated by the problem Smith had defined in his lectures: how could the evil of slavery be safely removed from the nation? Charles Fenton Mercer, the son of a Virginia slaveholder, graduated from Princeton in 1797 with the conviction that slavery should be abolished. He went on to become a U.S. congressman, a role that gave him a powerful platform from which to promote his beliefs. In 1816, Finley and Mercer proposed a colonization plan by which African Americans could escape the debilitating effects of white prejudice. They had tweaked Smith’s scheme in two important ways: the colony would be located in West Africa rather than the western territories of the United States, and it would be limited to black colonists only. Mercer and Finley met with Samuel Stanhope Smith in the fall of 1816 as their plans took shape. Finley then convened his first meeting in Princeton, before traveling to Washington in December 1816 to found the new American Colonization Society (ACS). The ACS immediately attracted the most powerful men in the nation to its ranks. James Madison, another Princeton alumnus, welcomed Finley to Washington, while James Monroe, his successor in the White House, helped the society to purchase what became the colony of Liberia in 1820. (The colony received its name from Maryland politician Robert Goodloe Harper, yet another colonizationist taught by Samuel Stanhope Smith at Princeton.) The ACS quickly became the most popular solution to the problem of slavery among ‘moderate’ whites across the nation. Colonization struggled to win support from free blacks, however, who suspected its motives and its white managers, and the ACS eventually drew fire from William Lloyd Garrison and other radical white abolitionists. But in the decades before the Civil War, the ACS received support from some of the most celebrated figures in American public life: from James Madison, who became the ACS president in 1833, to Henry Clay, Daniel Webster, Harriet Beecher Stowe, and Abraham Lincoln. The numerous connections between Princeton and the colonization movement led back to Samuel Stanhope Smith, and to the intellectual ambiguities of his racial universalism. Smith’s thinking was hamstrung by an over-dependence on physical malleability and a quiet privileging of whiteness. He rejected permanent racial hierarchies and recognized the corrosive effects of slavery, but placed so much faith in environment (and in the essential benevolence of the antislavery slaveholder) that his writings on race and slavery lacked a critical edge. By the time he’d developed his fantasy of moving black people to the West and experimenting with amalgamation, his more sober disciples had already embraced colonization without any reference to racial mixing. Nicholas Guyatt holds a BA and M.Phil. from Cambridge and completed his Ph.D. at Princeton under the supervision of Daniel T. Rodgers. Having taught at Princeton, Simon Fraser University in Vancouver, and the University of York, he joined the History Faculty at Cambridge in 2014. He has been a faculty fellow at the Stanford Humanities Center (2009-10), a British Academy Mid-Career Fellow (2013-14), and the Senior Visiting Research Fellow at the Rothermere American Institute in the University of Oxford (2013-14). “Princeton U. Sit-In By Black Student Group,” NJ.com, accessed 3 February 2017, http://www.nj.com/mercer/index.ssf/2015/11/student-occupied_building_at_princeton_u_opens_des.html. For general accounts of Smith's life and career, see: Edward L. Lach, Jr., ‘Smith, Samuel Stanhope,’ American National Biography, February 2000; Mark A. Noll, Princeton and the Republic, 1768-1822: The Search for a Christian Enlightenment in the Era of Samuel Stanhope Smith (Princeton, NJ: Princeton University Press, 1989). Lach, “Smith, Samuel Stanhope”; Noll, Princeton and the Republic, 185-243; John M. Murrin, “Introduction,” in Ruth L. Woodward and Wesley Frank Craven, Princetonians: 1784-1790, A Biographical Dictionary (Princeton, NJ: Princeton University Press, 1991), xvii-xli. Nicholas Guyatt, Bind Us Apart: How Enlightened Americans Invented Racial Segregation (New York: Basic Books, 2016), 22-28. Ibid., 199-201; Roxann Wheeler, The Complexion of Race: Categories of Difference in Eighteenth-Century British Culture (Philadelphia: University of Pennsylvania Press, 2000), 235-87; Thomas Jefferson, Notes on the State of Virginia (Paris: n.p.,  1785), 263-64. Samuel Stanhope Smith, An Essay on the Causes of the Variety of Complexion and Figure in the Human Species. To which are added, Strictures on Lord Kames’s Discourse on the Original Diversity of Mankind (Edinburgh: C. Elliot, 1788), 12; Ibid., second edition (New Brunswick: J. Simpson and Co., 1810), 267. See also Bruce Dain, A Hideous Monster of the Mind: American Race Theory in the Early Republic (Cambridge, MA: Harvard University Press, 2002), 40-80. Smith, An Essay, first edition, 94-96; Ruth L. Woodward, ‘George Morgan White Eyes,’ in Woodward and Craven, Princetonians: 1784-1790, 442-52. George Morgan White Eyes to George Washington, 2 June, 8 July, and 8 August 1789, Papers of George Washington, digital edition; George Washington to Timothy Pickering, 20 January 1791, in Octavius Pickering, The Life of Timothy Pickering, 4 vols. (New York: Little, Brown, 1967), 2: 474. Noll, Princeton and the Republic, 66-68. Dain, Hideous Monster, 48; ‘A Biographical Sketch of the Rev. David Rice,’ Danville Quarterly Review, 4, no. 2 (1864): 274-209, 275. Jennifer Oast, Institutional Slavery: Slaveholding Churches, Schools, Colleges, and Businesses in Virginia, 1680-1860 (New York: Cambridge University Press, 2016), 161-62; Terry L. Meyers, ‘Thinking About Slavery at the College of William and Mary,’ William and Mary Bill of Rights Journal, 21, no. 4 (2013): 1215-57. Samuel S. Smith, sale advertisement, New Jersey Gazette, 25 March 1784; Smith, An Essay, first edition, 92-93. Samuel Stanhope Smith, The Lectures, Corrected and Improved, Which Have Been Delivered For a Series of Years, in the College of New Jersey; on the Subjects of Moral and Political Philosophy, two vols. (Trenton, NJ: Daniel Fenton, 1812), 2: 172-75. George Bourne, The Book and Slavery Irreconcilable. With Animadversions upon Dr. Smith’s Philosophy (Philadelphia: J.M. Sanderson & Co., 1816), 144; Smith, Lectures, 2: 176. Guyatt, Bind Us Apart, 263-75. Bourne, The Book and Slavery Irreconcilable, 146.